Galaxy Trucker is all about building an awesome spaceship and then boldly go where no one has gone before, to a galaxy far far away. Chances are your ship will break down, get hit by meteors and shot at during your travels, and it might not make it to the end (it being build with old sewer pipes and other junk). 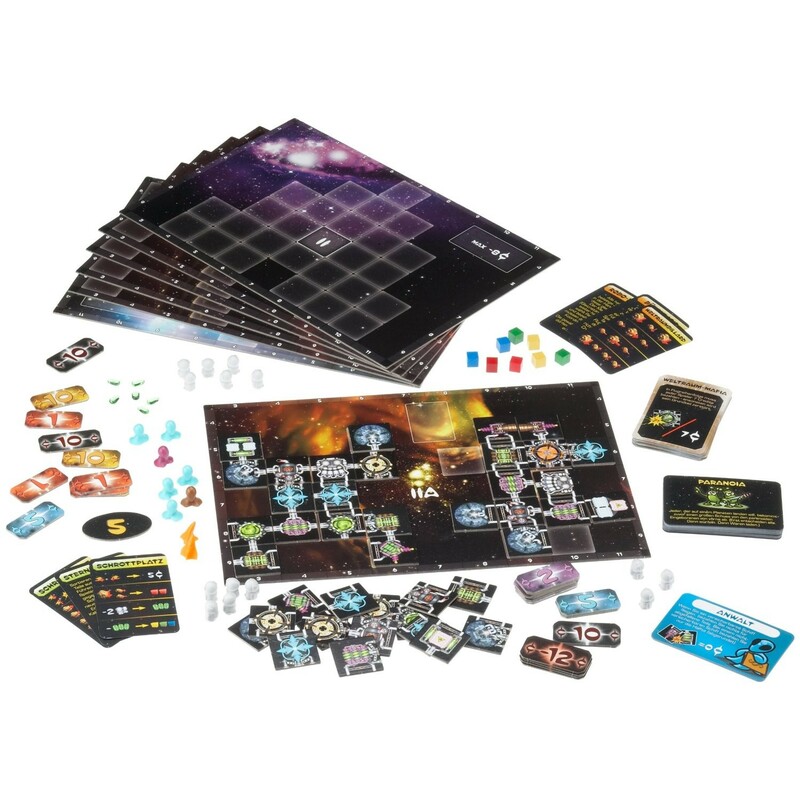 What is Galaxy Trucker like? Galaxy Trucker is a game played over three rounds. Each of these rounds start of with the core of the game: building your very own spaceship. This is done simultaneously by all players on a timer. And you have precious little time to build your perfect (I promise you it won’t be) little ship. This is done by placing all the components (titles) in a big pile in the middle of the table with their back side up. When everyone is ready the timer starts and then all hell breaks loose. You’ll be trying to grab engines, cabins, cannons, cargo holds and many other strange and wondrous things. When you grab component from the pile you have to either place it on your ship or put it back face-up in the pile and once you grab a new component you can no longer move the previous component anywhere else. So you have to think fast and build even faster. In the end you’ll end up as the proud owner of a piece of junk spaceship that most likely wont be able to make the Kessel Run in 12 parsecs. Once everyone has built their own little beauty of a ship then it’s time to see how she flies. You all run through the same series of random encounter cards ranging from meteor storms. abandoned ships and stations, slavers and pirates and last but not least planets. Your ship most likely get damaged, and possible even destroyed in the process. You go through all of this to earn credits and at the end of the third round the player with the most credits will be the winner. Each round of the game will include more and more dangerous cards to face, and at the start of each of them you get to build a new ship from scratch. And you’ll have more and more room and time to do so. I was sure I would not enjoy this game. Things on a timer is not normally my thing. 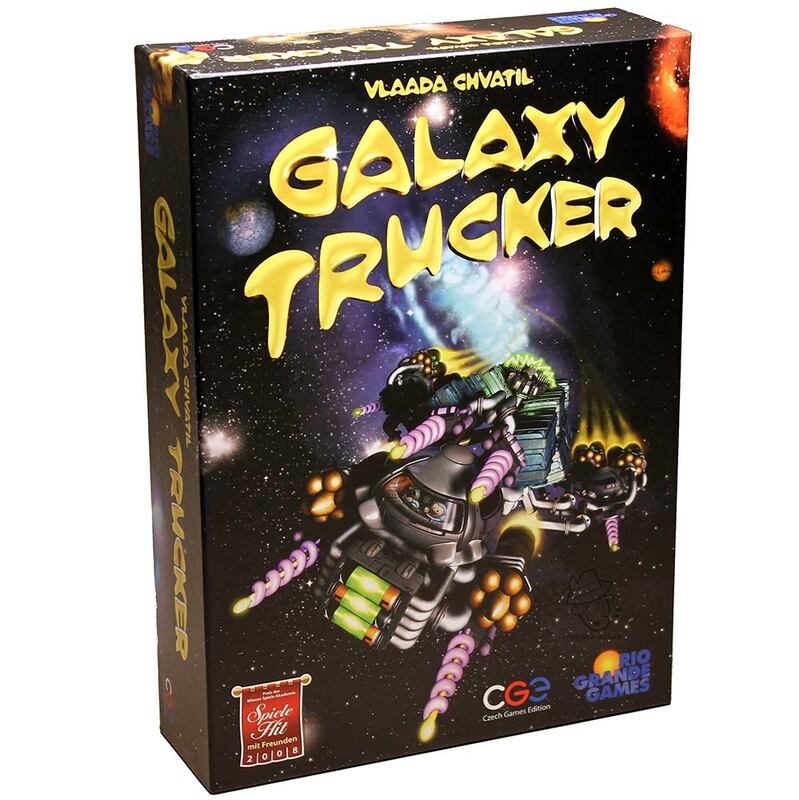 But Galaxy Trucker really surprised me, I really REALLY like it. Vlaada Chvátil has once again made an awesome game and made me like a genre I didn’t before (he did the same for Codenames). Not only is the aspect of building your ship fun and rewarding, it also makes you invested in how it fares during its travel. It makes it exciting to see what happens to it and see what’s happening to your opponents ships. It is a great experience you can talk and laugh about afterwords. Even if your ship get’s destroyed it’s not that big a deal, since there are three rounds in the game. How can this game be so much fun? I’ll tell you how. The frantic shipbuilding, where everyone’s throwing tiles left and right to try to find the right piece for their hunk of junk. It’s like playing Carcassonne on steroids. It is a blast!. Everyone is in the same situation, everyone is struggling and everyone is having fun. And after that you get to see your ship do it’s best not to get destroyed and earn enough credits to beat the other guys. I realize that if you are the kind of guy who likes to plan everything out and cant stand a little fun randomness destroying your plan (and your spaceship), you will most likely not find this game nearly as fun as me. The core of the game, building a cargo freighting spaceship out of junk, really shines through. The components and the rules for them makes perfect thematic sense. The whole visual look and feel of the game is cartoonish and silly, but very well done. And it all fits very nicely with the feel of the game. The rulebook is just awesome. One of the few rulebooks out there that’s actually fun to read. Cards and titles are a nice sturdy quality and the small figures for crew and the battery tokens are great. All in all high quality game. The game is actually very simple to learn and easy to teach. Especially if you start with the “tutorial” for your first. Richard Ham (better know as Rahdo) has done a nice runthrough of the gameplay. Check it out if you want to get a better feel of how to play the game.